Time for me to finally sort out my closet. 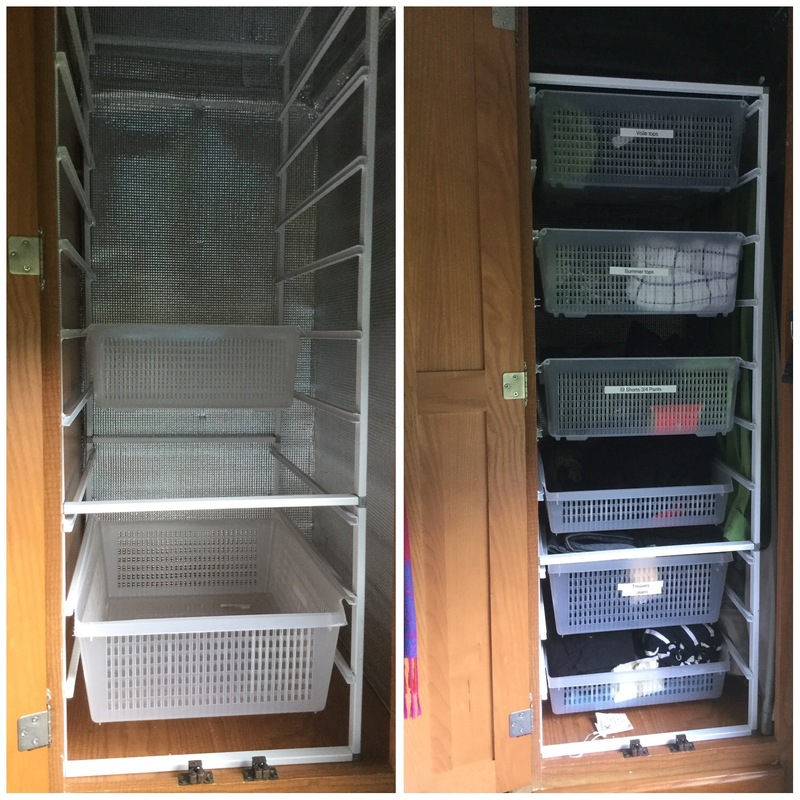 We have made many adjustments to the wardrobe space and made many changes over the years but nothing has ever been totally satisfactory, until we finally came up with the solution. 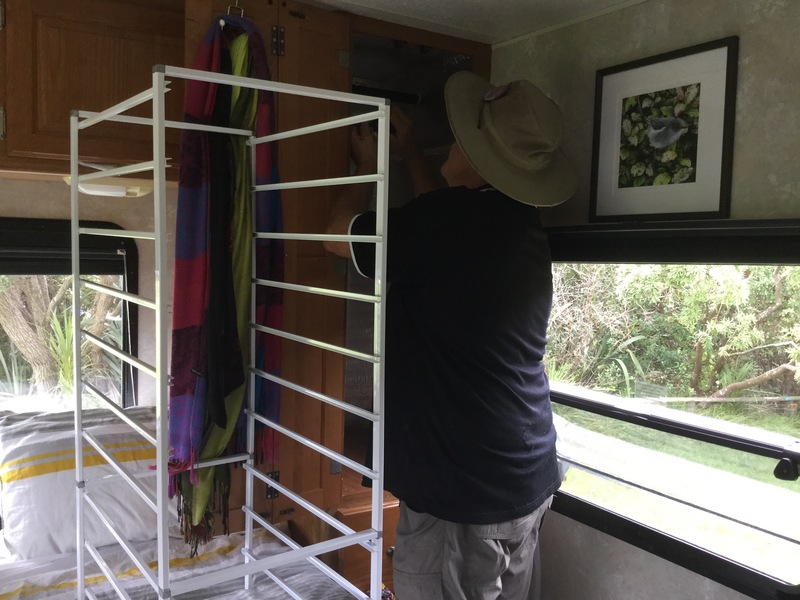 Wanting to utilise the baskets we already have, we finally found a shelving system that we could put together which would fit the baskets we have as well as being adjustable for the wardrobe space plus leave a little room for hanging garments as well. First we had to put together the racks, cutting the width down to fit the baskets. That done, a minor adjustment was needed to the wardrobe space to fit it all in easily. Next it was time to check and see if everything worked and fitted. Perfect. A good time to sort out the clothes and make a donation to the local charity shop. It may never t look like there is much hanging space left in the wardrobe but it’s just the silly angle I took the picture making it appear as tho there is no room. That job finally completed and ticked off the list. Another job that has been on the list for a while is painting the blocks we carry around to use for levelling the van. Roy spent a few days applying coats of paint to the blocks and then attaching straps to them so that when the blocks are in place under the hydraulic levellers, they can be easily retrieved by pulling on the straps. Another job has been to repaint the A-frame used for towing the RAV4. This necessitated sanding it back, applying masking tape to areas not required to be painted then prepping it with anti-rust stuff (technical term that! 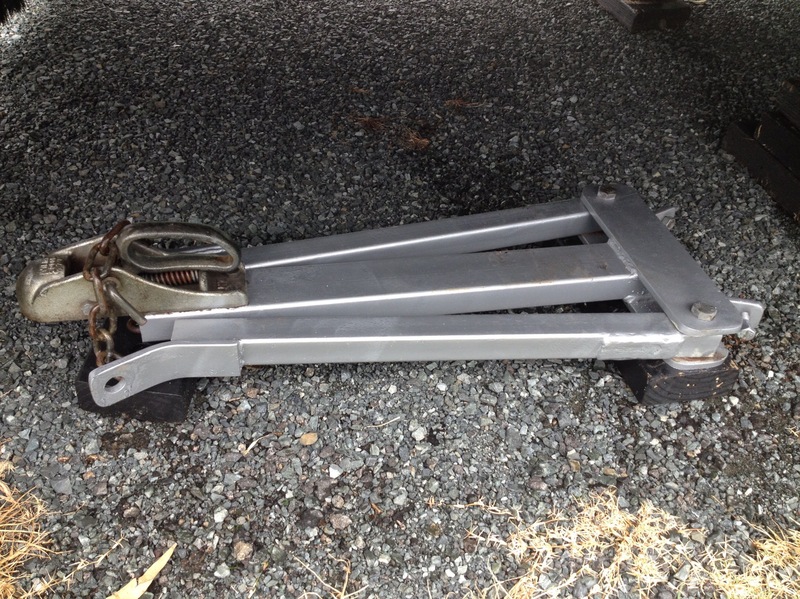 ), before painting it with the specialised paint. And damn fine it looks now too. Note the carefully painted blocks it is sitting on! We have a large inbuilt LPG tank which is in an open locker so gets covered in road grime and the odd stone chip. When the tank was checked for recertification last year, we thought then that it would need a repainting and treated for the odd rust spots where stones have chipped away the paint. So Roy has also done the same to our LPG tank. He rubbed it down, sanded it, and painted it and now it looks pretty tidy as well. Another important task was to sort out an issue we discovered with the brake lights, as the other day when I followed Roy in the van out to the get the brakes repaired I noticed that the lights were only coming on when full pressure was being applied to the brake pedal i.e. when coming to a complete stop. Apparently there is a pressure type switch thingy (another technical term) under the dash that had come a bit loose but to access it is a little difficult to bend oneself over the engine cover, around the seat, under the dash…..apparently ‘one’ is not as slim or as bendy as ‘one’ was!! 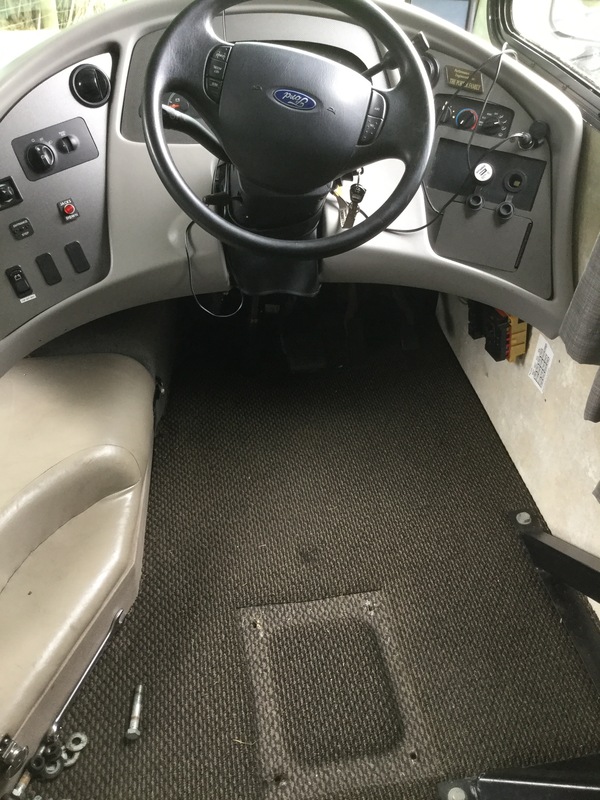 To make it easier we removed the drivers seat. Can you see where the seat was?? Switch fixed, tested, seat reinstalled, all done. Now we just wait for more parts for the brakes which should be here early next week, then fingers crossed they are well and truly fixed and we can be on our way. The escape tunnel is a washout, drowned in a deluge of torrential rain but more on that shortly. First onto much nicer things, Friday night we went to Steve & Leslie’s for dinner which was a very nice impromptu dinner. 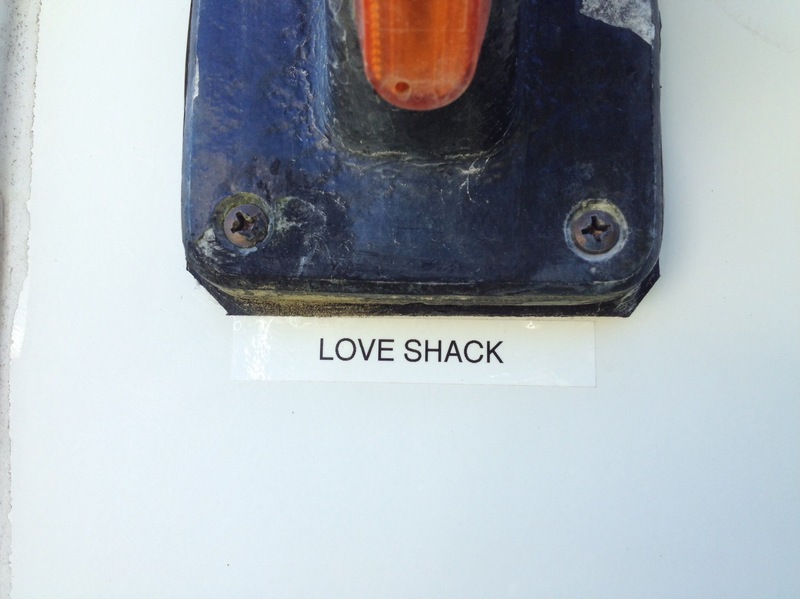 Whilst there, the fellas hatched a plan to go fishing early in the morning so the boat was quickly prepared and hooked up to Steve’s car ready for a quick getaway in the morning. 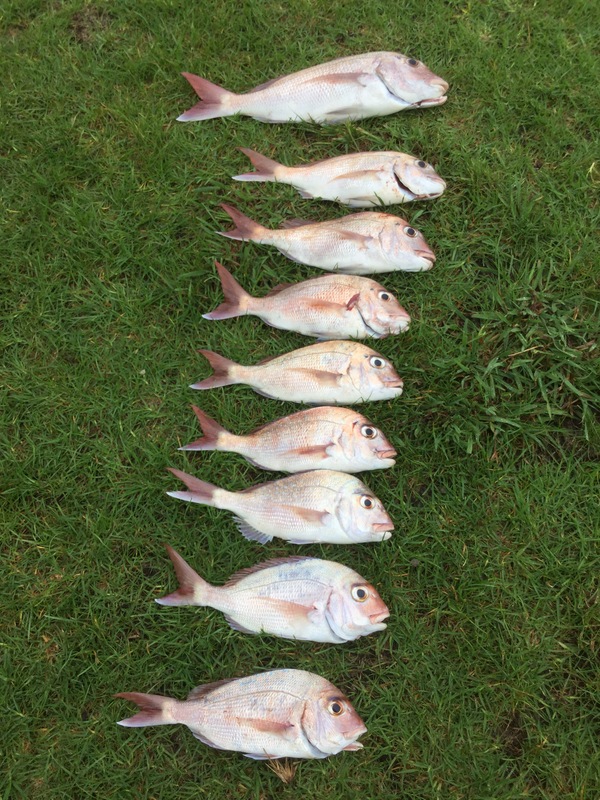 Indeed they did head out from Army Bay and were back after a couple of hours with a lovely haul of 9 good sized snapper. Great, we know what we are having for dinner!! Roy weighing the fish whilst Steve checks the numbers – yes, it was a good one. 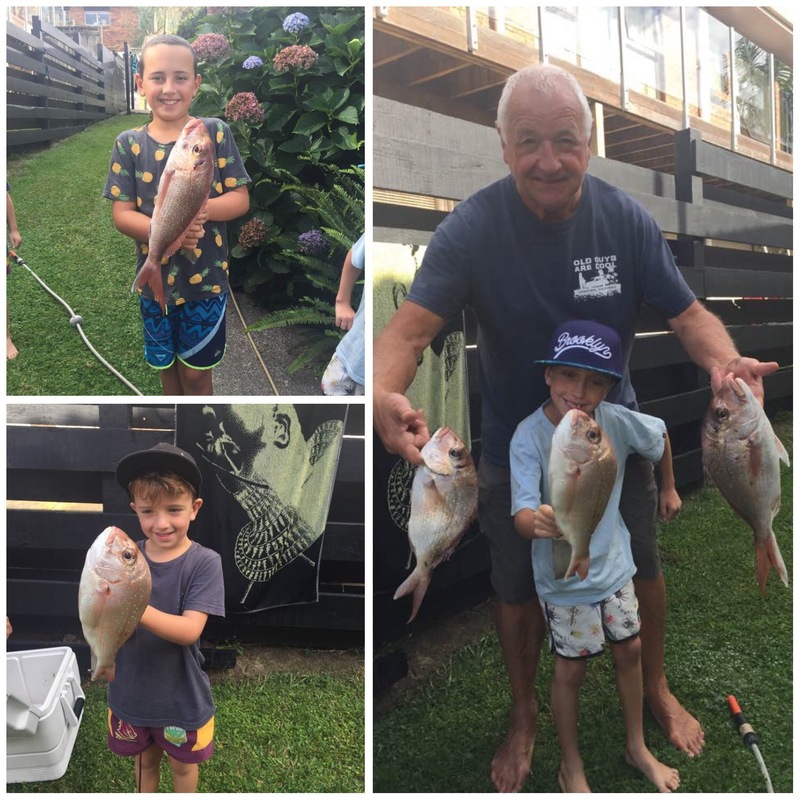 Later on in the day, Steve rang to say that they were having their three grandsons for the night so he was thinking of bringing them up to go out fishing in the morning. A look at the weather forecast, and a bit of a brain wave, and we came up with a revised plan which was for them to come up in the late afternoon and we could have takeaways on the beach whilst Roy and Steve took one boy at a time out for a fish. Which is exactly what happened. 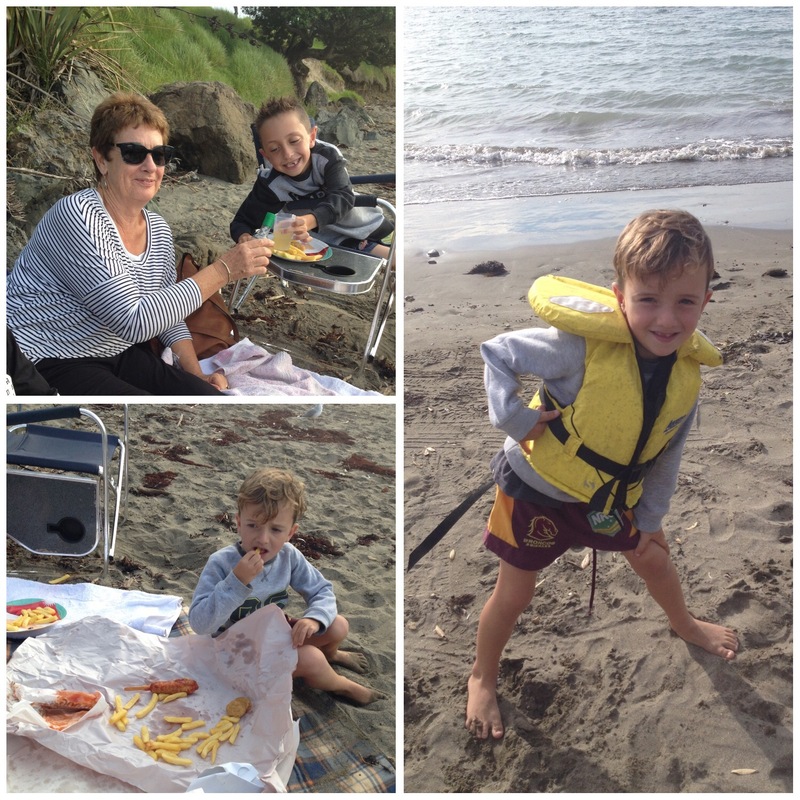 Fish and chips at the beach, life jacket on ready to go. 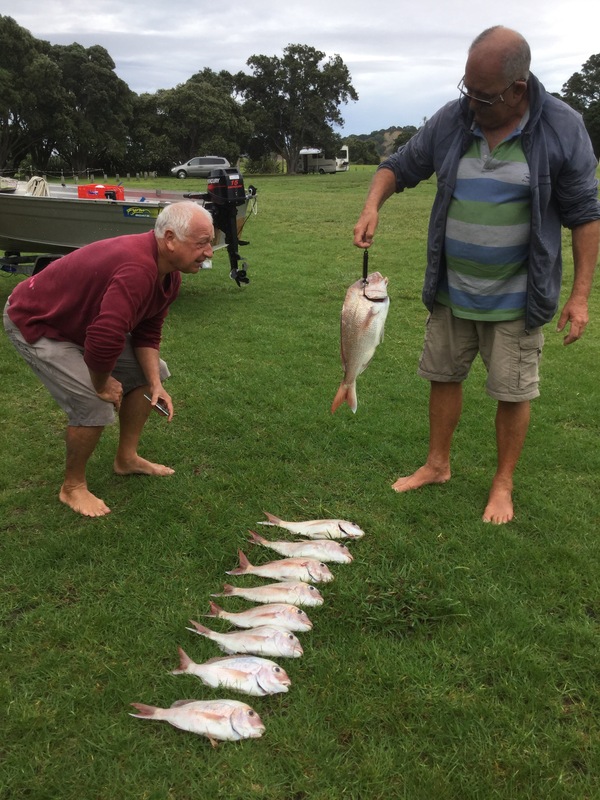 Showing off their catch the next morning before Poppi filleted them all. 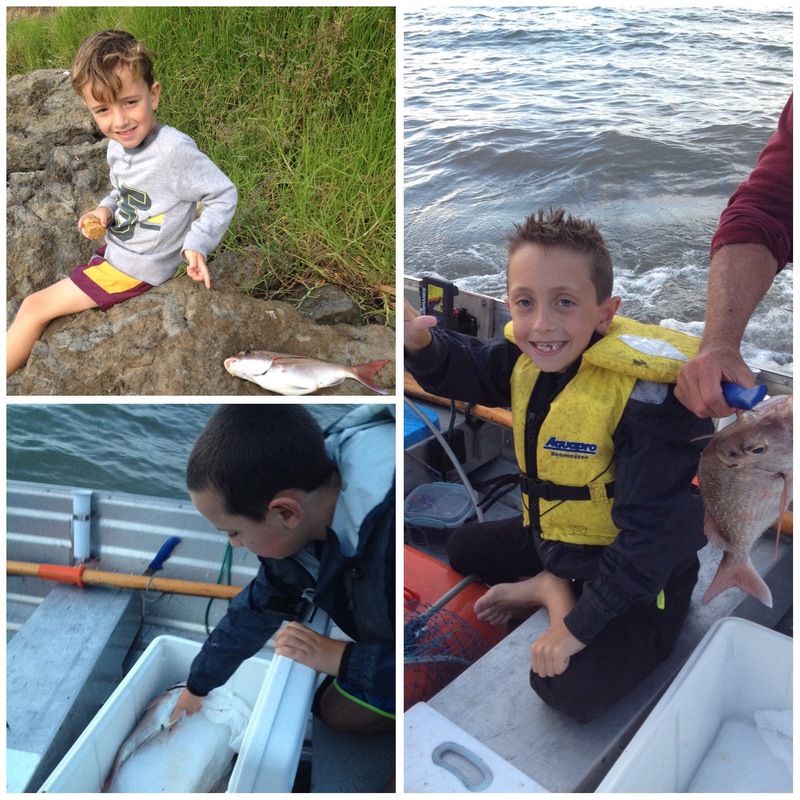 It was a great days fishing and lots of fun and laughs for us all – just ask Asher about Aunty Bernice’s Adele impressions, he laughed until he cried!! !of course it was because I was soooo good and my voice is just like hers hahahahahah. Just as well we did all our fishing on Saturday as Sunday was forecast to be a little damp, sure enough late on Sunday night the heavens opened. We had retired for the night and were safely tucked up in bed when the rain really started to pelt down. 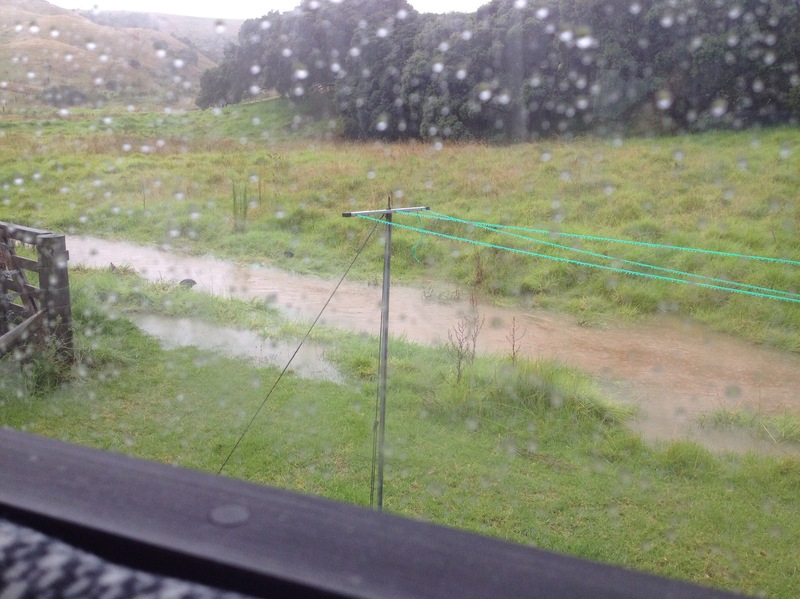 I got up to check out of the window to see if everything was OK as I thought I had heard a car revving it’s engine and sure enough there was a car belonging to a camper desperately trying to get out of rapidly rising waters. A look out of the van window to the rear of the bay we are parked in and the creek at the back was well over it’s banks with a river of water running just a few metres from the van. At this stage I woke Roy, he got up and ventured out to see what was happening and to make sure that campers were ok (luckily there were only three groups camped in the park). One lot of campers at the rear of the camp site had flood waters rush into their tent and they were desperately moving their car and trying to pick up their tent and gear and move to higher ground. Another family in the next bay to us we’re removing everything they could out of their tents into their vehicles and were abandoning their camp. By the time Roy had checked on everyone and made sure that the road out was still driveable for those wanting to leave, the waters had risen to surround our van and the water lapping at the wheel rims…time to quickly gather up our bits and pieces and move. 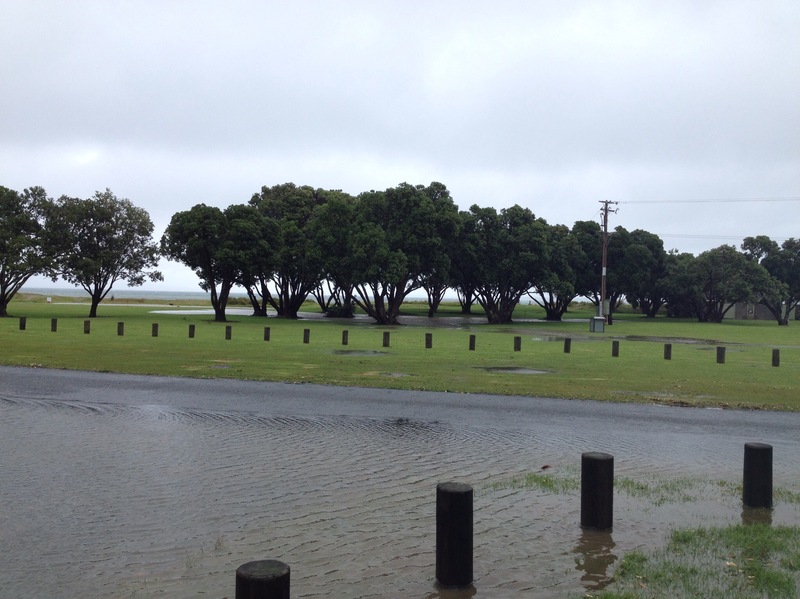 Besides, we knew that it was low tide at around this time (1am) and we were not sure what would happen at high tide. We were quickly into moving mode, I got into the car and positioned myself so that the headlights would light the way for Roy to get a good view of where to drive, meanwhile the rain is still bucketing it down. Safely moved, we then woke up some tourists in a motorhome who were about to be completely surrounded by rising water levels….again, I directed the car headlights to show them the way. 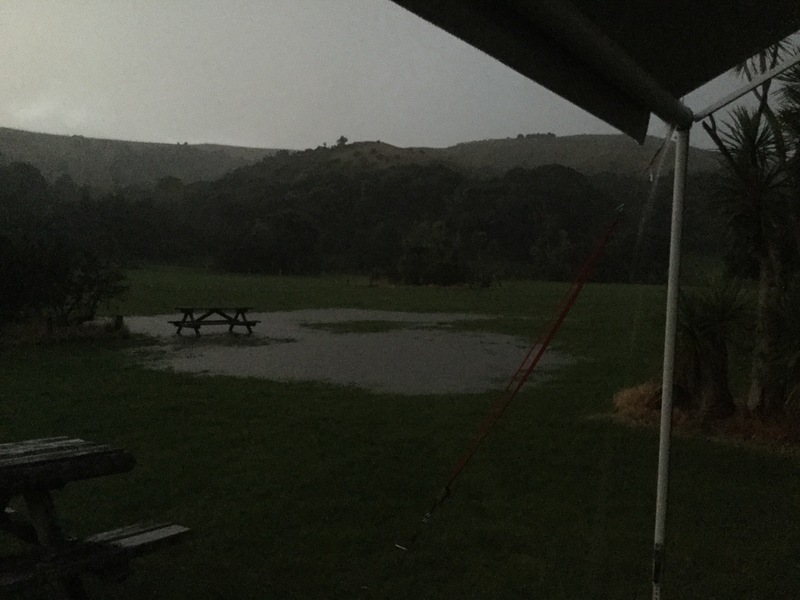 By this time it was 1.30am, we were wet, bedraggled, but safely away from the torrent of water racing through the Camp and all campers were safe. Of course no pictures were taken at this time, it was too damn dark and wet as well as being too busy getting ourselves sorted to be thinking about pictures. We woke in the morning to find that overnight the rain had stopped, the flood waters were quickly receding and the sun was beginning to shine. The family of campers returned to dry their gear they left behind out in the sunshine before packing it away, Others were also trying to dry wet tents, sleeping bags and gear. With further rains forecast with thunderstorms for later in the day we have parked ourselves on the concrete pad in the middle of the camp well away from the creek and any wet soggy ground. By mid afternoon everyone else left the camp and we are by ourselves. Rain pouring off the awning and our lake side view! Today is again brilliant sunshine so with all the washing done and the wet gear all dried out, we are hoping that that is the end of the heavy rains for a while. 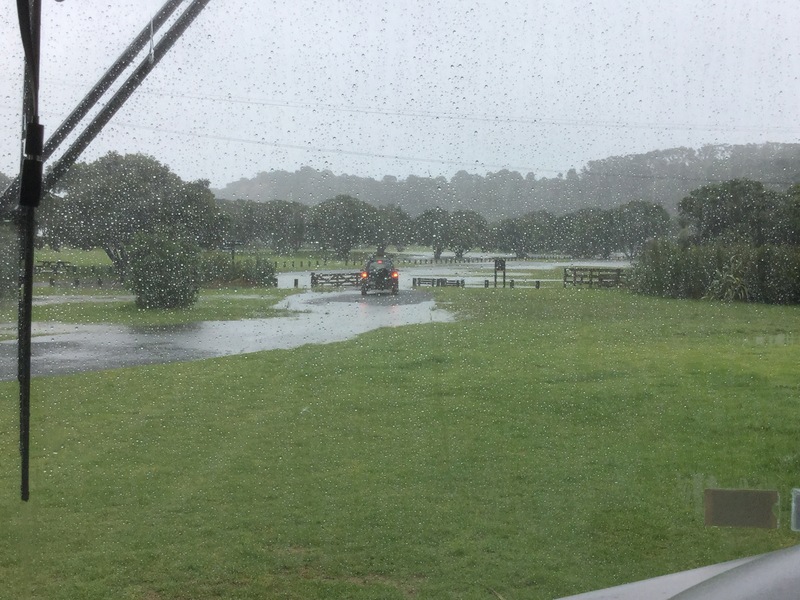 There has been a little bit of rain falling around the region and apparently it’s not about to stop anytime soon over the next few days, although we have had a welcome reprieve for a few hours but we are all high and dry managing to keep away from most of the wet stuff. The view through the rear bedroom window. Today we would have been lunching in the wet! Today all of the lakes have disappeared however with more rain forecast to add to the already sodden ground it won’t be long before they reappear. Roy braved the elements to take the RAV in to get a new windscreen fitted after a few too many stones from roadworks attacked the windscreen ….but that’s another story. 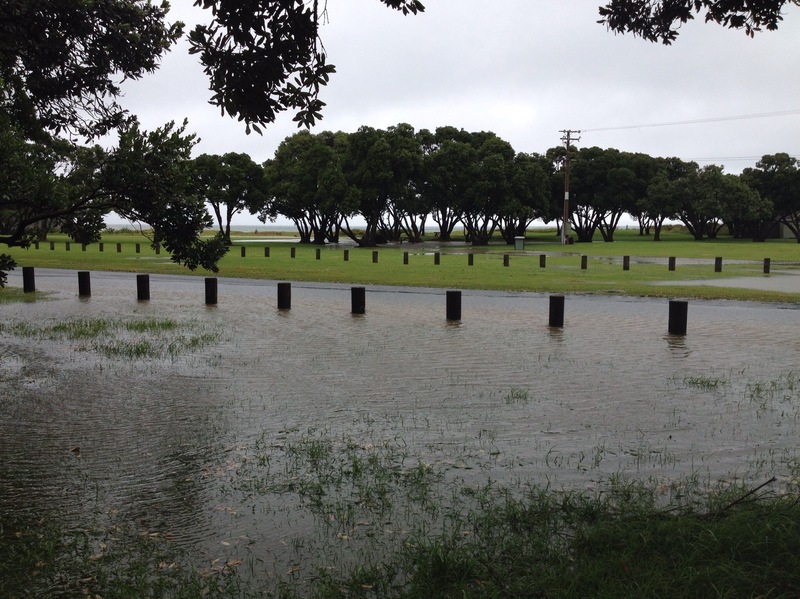 Lakes formed all through the park with the only ones enjoying the deluge were the pukekos. Summer may have officially slipped in autumn this last week but the temperatures are still saying that it’s definitely summer time with lots of sunshine and warmth although I think that is about to change. It’s also been a busy week what with one thing or another. Friends Brian & Marj came to join us for a few days, funnily enough it’s almost 6 years to the day since we first met them. 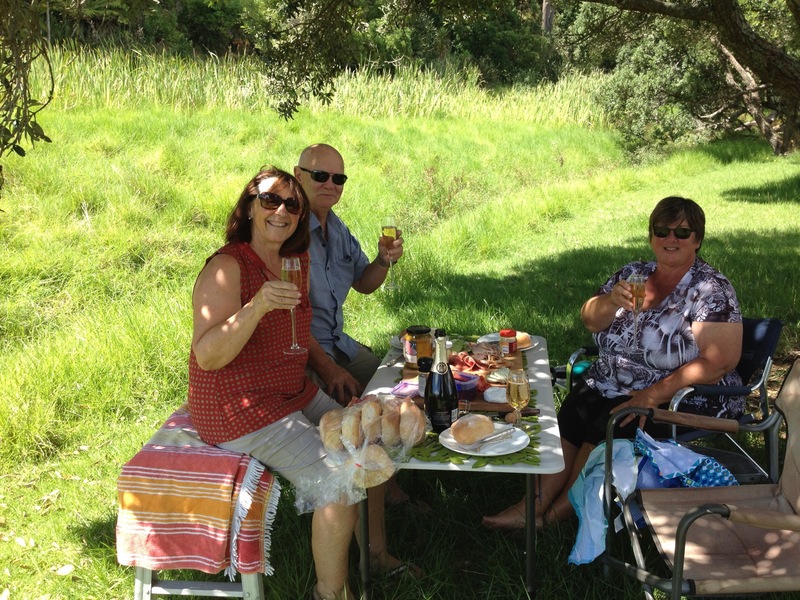 We were real greenhorns then with just one days experience of living full time in the van but they were very kind to us and gave us lots of useful advise about living full time on the road including happy hour etiquette which you can read about here. However this time I neglected to take a single picture of us together, I must have spent too much time chatting! 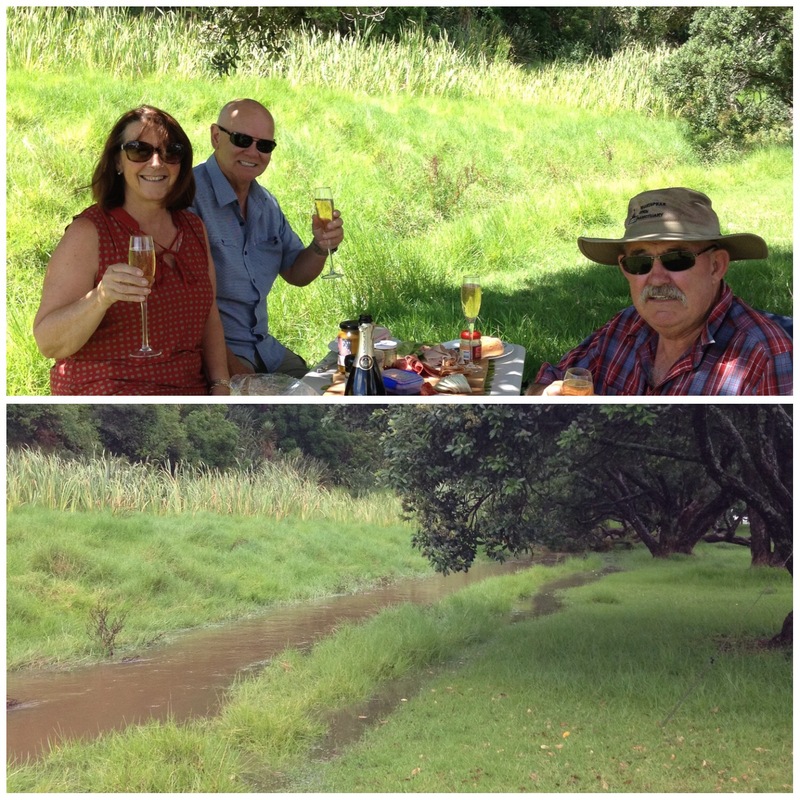 It felt as though we were constantly on the go as it was a busy week of appointments, most of which involved fighting the Auckland traffic….groan. 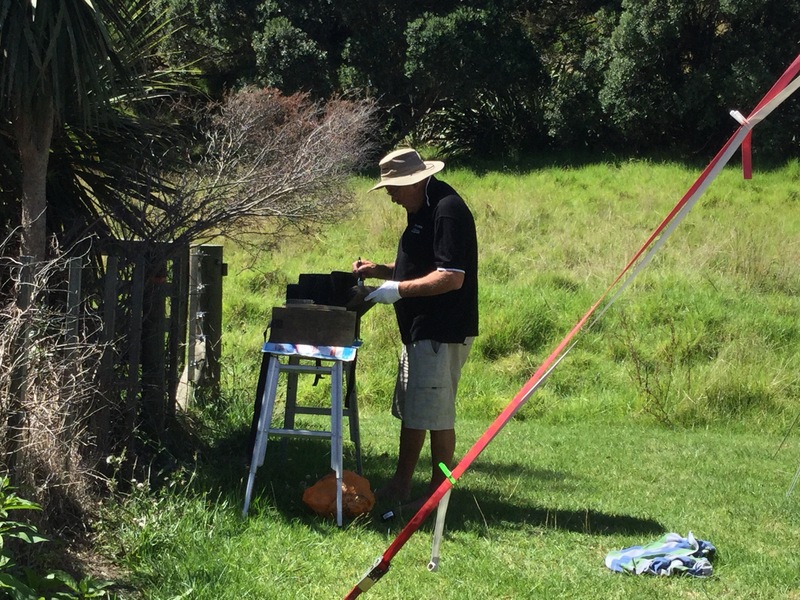 First off Roy had an appointment for a scan, no problem, it was not too far away in Wairau Road which is not too far from Shakespear , just 35km down the motorway. So one hour and 35 minutes later he arrived for his appointment! I don’t know how, or why, people commute through the madness of traffic everyday, it would drive me nuts. But lesson learnt, don’t make any appointments during the commuter/school traffic peak times. The next day we had another appointment but this time just down the road at Silverdale where the van was getting its brakes sorted and it was 9.30am that the van had to be in so it was a quick trip down the road. We then went on to Steve & Les’ in Torbay for the day and also to get a bit of shopping done at Albany. We picked the van up in the late afternoon and headed off to the dump station at Hatfield Beach to take care of necessities before heading back to Shakespear. 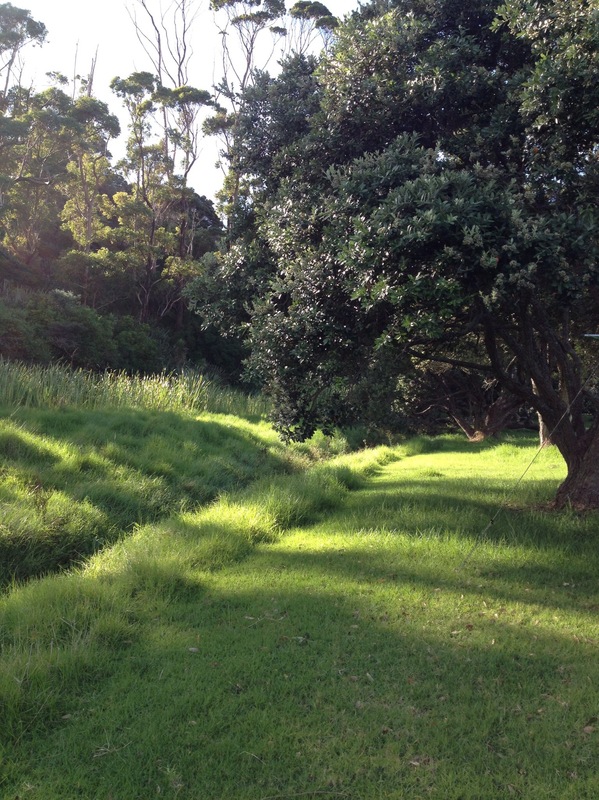 But it wasn’t the end of our running around, the following morning we were both off to the Doctors in Mt Albert for our annual checkups. This time we allowed plenty of time to get there and with a late morning appointment we had a good run through with it taking us just over an hour. From there we headed to Manukau to meet up with Antony to collect our mail and to have lunch with him before we headed back to Shakespear. It was another reasonable run taking just over an hour and a half this time. According to the newspapers the traffic problems are set to continue to get worse with “March madness” occurring this month. I think we will try and avoid travelling across the city especially at peak times. By the time Friday came, we were both ready to have a day without travelling anywhere! 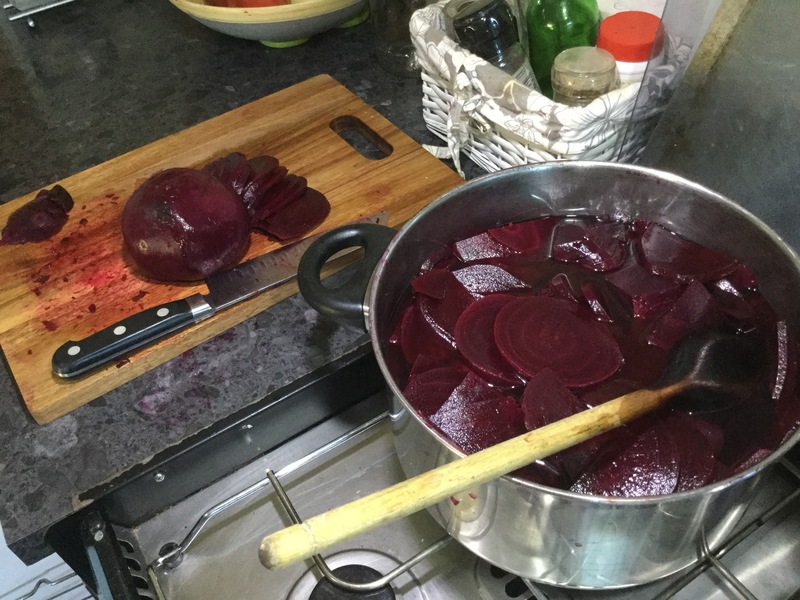 Not that I was idle mind you, no, it was time to bottle a huge pot of beetroot! Beetroot getting ready to be bottled. 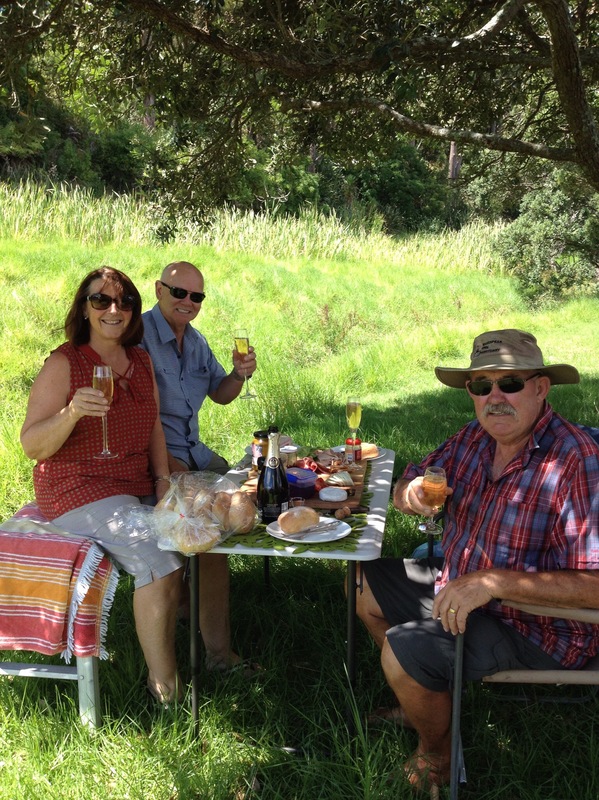 More visitors through the week, with Gary & Marg calling in for a catch up on their way through Auckland before heading to their home in Tokerau Beach. It won’t be long and we will be back up their way again where we look forward to sharing some fishy tales as well as some fish! After extensive investigations we are pretty sure we have discovered the identity of the phantom labeller …….let’s just say that a certain bald Ranger, currently on a road trip around the South Island may get a surprise one of these days! All in good fun of course.